Game week 12 turned out to be a fantastic week. 68 points on the board resulted in a significant jump on the overall leaderboard to a position I’d be much happier with come the end of the season. It was also very worthwhile to hold the transfers until after the international break. B. Silva and Schmeichel also ended up outscoring Kepa and Richarlison. The only real disappointments for the week were that Mane and Kane didn’t do more. Another clean sheet for Schmeichel was very pleasing. Especially as this appeared to be a slightly risky choice as hardly anyone else has him in the mini leagues I’m entered into. I’m still not convinced he’s a long term choice however I can’t complain with two clean sheets in two games. Star man and 15 points for Robertson. I’d imagine most people have him but it was good to catch up ground on the very few that don’t. Star man for Doherty. Very close to a clean sheet as well. He’s proven a good move and has consistently picked up points despite not keeping a clean sheet since I’ve put him in. A goal each for Salah and Aguero. Star man and an assist for B. Silva. Given Man City’s fixtures it’s now going to be a very tough choice around leaving him in or taking him out. I like the look of Richarlison playing Cardiff but Man City have two fixtures over the same week. It’s also looking less urgent to replace Schmeichel with Brighton, Watford and Fulham on the horizon. It’s frustrating that Kane, Salah and Aguero have been a little inconsistent this season but they are currently the top scoring strikers in the game. I can’t see a case for taking any of them out yet. Schmeichel isn’t a keeper I’d have chosen normally. However with good fixtures coming up and two clean sheets on the board already it’s difficult to make a case to take him out until his form drops. Worth keeping an eye on at this stage. B. Silva was going to be the player to make way for Richarlison. However picking up the star man this weekend has made me doubt this. Maddison is a concern with an injury and lack of big points over recent weeks. However he’s difficult to replace as his value is so low. Mane is another one in midfield to keep an eye on. The problem is, it’s hard to justify taking out a fit player who is capable of scoring big at any point in time. Under normal circumstances, I’d say Man Utd’s fixtures are definitely favourable but with the way results have been going I can’t see me moving for any of their players at the moment. Chelsea and Spurs play each other which could be a low point scoring game. Spurs then host Inter in a must win Champions League fixture. Liverpool face Watford in the Premier League and then travel to PSG which will be a tough game. Everton and Richarlison could be a team to look out for in particular as they host Cardiff. At this stage my own plans are to wait until after the international break and plan my next moves. I’d be surprised if I don’t try and bring in Richarlison. As mentioned above I’m also keeping an eye on the goalkeeper position. On paper swapping B. Silva and Schmeichel for Kepa and Richarlison still seems like a good idea. However I’m not 100% sold on this idea. There’s a risk that this won’t be affordable after the international break with prices changing on Friday. I think I will have to take this risk for the benefit of holding onto the transfers. As long as B. Silva or Schmeichel don’t drop in value I should be fine. Will need to downgrade kepa to someone like begovic to afford. Feel like I want as much city coverage as possible for now – they are steam rolling past every one. I have the exact team. 0 in the bank. Was thinking of replacing Mane with Sterling or Mahrez. More difficult to get Sterling now though due to price changes. It’s a tough one. 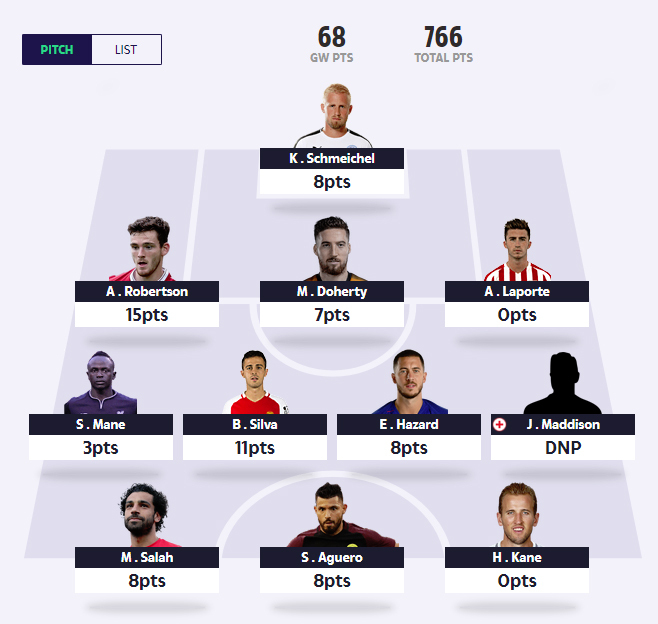 Sitting top of my mini league on 775. There’s more incentive to try get into that City midfield. Like the post above said they are blitzing teams a few goals to nil on most occasions! Obviously Liverpool will be the same on occasions however im happy with keeping Salah atm. “Some big FPL news, Kieran Trippier has withdrawn from the England squad with a groin injury and L’Equipe are reporting that Benjamin Mendy could require surgery on a knee injury that is keeping him out of the France squad. I’m the same Chris still not sure whether to chuck Mane out for D. Silva who has been alot more consistent this season, they have the hammers away aswel? I don’t mind that. I have both Mendy and Laporte, but losing Mendy will free up some funds. Of course hazard hands down, but considering issues with his back and guessing rest time in Europe now they have qualified is he worth the loss of Mendy to Doherty? Doherty so far has out scored Mendy but surely Mendy will gather more points over the season. Wondering what combination you guys would go for? Word of warning Gaz, both Mendy and Doherty have pulled out of their international games with injury (along with half of the PL players it seems, internationalitus?). Talk of Mendy having to go under the knife also. Hang fire buddy. Hazard and Doherty for me though to answer your question. Both absolutely nailed on starters unless nursing injury as Hazard has been doing lately. Cheers Chris mate, yeah it would be good to know who’s actually injured and who just wants time off. I would love to wait till after the international break but worried about price changes this coming Friday. “0” in the bank so it would be straight swap with their current price values. Hazard & Doherty are virtually guaranteed to increase by 0.1 and if both Willian or Mendy don’t match their price changes then I can’t afford the swap. Or there is the option of sterling instead of hazard? I know he’s sometimes a risk with rotation but seems to be playing more often and scores well. Plus can you see hazard playing any remaining Europa group games meaning potential more games for sterling? Would be a high risk move Gaz but I’d applaud your balls if you did (now there’s a sentence I ever thought I’d say!) Sterling has, in the past, been rested after internationals so you may need to take that into consideration? Think I’ll stick in another midfielder, go 343, lack of extra games, & I haven’t been one of his biggest admirers in the past, but going to opt for Richarlison barring injury,good run of fixtures coming up & anything can happen in a Derby match, was thinking about Mahrez, but teams I’m chasing down have gone big on either Chelsea defence or City midfield, most teams above me don’t have Kane or Salah,definitely not both need to retain them & hope they score heavily after international break. Has anyone else had any “pending” transfers that have not gone through yet? I thought that they went through at 7am every Friday? Wanted to get it through before the price changes you see. It will go through eventually, just don’t change it until it has. They never go through at the right time (it is supposed to be 7am), admittedly its not usually this late. Just another example of Dream Team being a law unto themselves!!! The reason I made them in the week was to beat the value changes. I’ve emailed them so hopefully they can resolve it. It’s a good job I made a mental note of the valuations as I could have easily missed this. Have your transfers gone through with the new valuations also District? So, how are your teams shaping up as we approach GW13? Any areas you’re not happy with? Any suggestions moving forwards? Feel pretty happy about it to be honest. Slight concern over Doherty with his face injury but I’d be surprised if he misses out on the Huddersfield game. I’ve not heard of any other injury concerns on the other players so hopefully a clean bill of health for GW13. Ryan will be coming out next month I think when Brighton’s fixtures stiffen up. Teams looking good Chris as you say just need to sort Ryan out when you see fit. Are you top of your mini leagues? I presume so it will be a case and wait and see on the others in your league unlike me. Was looking at ederson and rudiger for Schmeichel and Sterling. Any ideas? I think those moves you suggest could do very well. We need to be getting into that City midfield that’s for sure. I’ve also heard that KDB is close to a return already. Maybe wait until you hear the team news for City before making that Sterling transfer though as he’s been rested in the past after international games. I have 1 transfer remaining with £1.4m ITB. Yes think I will wait. Players I’ve been looking at are Danilo 3.3m if he starts playing now Mendy’s out. He started for Brazil the other night. Also seen Callum Paterson for Cardiff down as a defender when he’s playing up top. Crazy to put him in but looking at budget players as trying to get Salah and Sterling in. Good team Chris. Wanted to get Gomez in my team for a while now. 0m in the bank. 3 transfers left. Scratching my head at the moment. Would like to get Gomez in that defence somehow. Paul Warhurst was a Sheffield Wednesday legend! Think you probably have to downgrade Kepa to manage that. I’d be tempted to stick for now with you already having Liverpool defence coverage. Also, is Maddison expected to be fit after the IB? Think he may be out. Yeh Kepa may have to be downgraded. Possivly transfer Mane out too for Mahrez.I’m leaning towards sticking for now. Thanks for the feedback Chris! Looks a decent team. That’s exactly the team I’m tempted to move towards by taking Schmeichel and B. Silva out and putting Kepa and Richarlison in so you’re a couple of moves ahead of me already. Mane and Lacazette for Dubravka D Silva and Salah? 👊 Knew I could rely on you Allan. 😉 (and KOFN). I’d be happy with that team. Richarlison is my main concern going into this weekend. Do you have any transfers left? Thank you for contacting us regarding your Transfers Query. I am happy to advise you on this today. We have made a slight change to when transfers are credited each month. Instead of the transfers being granted on the first day of the month, they are allocated at the start of the first Game Week of the month (first Friday of every month). We are hoping that making this change will help to make them easier to understand. – Go to your team page and it will show you how many transfers you have remaining for the month. Each month it will reset to be three. – You can make each of your three transfers at any point during the calendar month. – Any unused transfers can’t be carried over to the following month. It’s use them or lose them. – You can make your transfers at any point during the calendar month, including International break. – If a player has played in a Game Week and you wish to transfer them in/out, the transfer will not go through until the following Game Week. If you made your transfers in the previous Game Week, and they went through this Game Week, then please be advised that the Variable Pricing is updated at 0700 every Friday Morning (the same time the new Game Week starts), so if your Transfers are Pending then they will go through with the new pricing of your Players. If you require any further assistance, please do not hesitate in contacting me, or anyone here at Dream Team, we will be happy to help. The bit towards the end is a bit confusing. I made me two transfers last week (making them pending). This left me with £1.4m ITB. However when the transfers went through, they showed up as having gone through with the NEW valuations. Now I should have been out of pocket because of this (I wanted to beat the value changes with my transfers) but my bank balance actually remained at £1.4m! As far as I’m aware Chris pending transfers go through before the price changes take effect. So if you transfer in a player who rises in price you will get that rise and if you transfer out a player who drops you will avoid the drop. What transfers did you do? I’m pretty sure you’re right in what you say as the bank balance I had when the transfers were pending, remained the same after they had gone through. I don’t think the DT response made it very clear though. Happy to help, i’ve asked them questions before and can barely get a word out of them most of the time, although judging by the answer you got that might actually be preferable!! Really want Salah and silva. But the only way is to swap lacazette mane and laporte.. leaving me no city defensive cover and he’s a big scorer . So thinking based on remaining fixtures to swap rudiger to stones and double up on city coverage and hope they keep clean sheets.. and martial in for lacazette based on current form and fixtures . Or do you think I’m swapping for sakes it..
At this stage I would consider more than just this months fixtures. I would be focusing on December fixtures now as there are a lot of games in December and injuries frequently happen so if you set your team up for December now using your November transfers you will have your December transfers for injuries/setting your team up for January. I’d probably stick with what you’ve got. I wouldn’t want to lose Laporte and if you really want Silva you could just swap Mane for him. Any views on who to replace Mendy for? I really like Gomez. Almost a guaranteed starter now (even though he’s up against “the best defender in the world” in Lovren 😉). Can play right-back (potential for attacking points) or CB. Liverpool’s defensive assets alongside City have been the ones to aim for this season. Beyond Gomez, as Callum points out you probably should be looking at the likes of Luiz. Chelsea do have a few difficult fixtures coming up though (Spurs away, City at home) so bear that in mind. Cheers both. Yeh, I’ve been contemplating Chelsea coverage for some time, especially as the only hard games they have are Spurs and City up until mid January. The only problem is that Luiz is the only affordable one at the moment and I’m not sure I trust him. He’s prone to getting booked/sent off and was never a guaranteed starter until this season began. The way my season has gone so far, I’d bring him in and he’d start getting rotated, but worth some thought. I’d be tempted to replace him with someone cheap from Wolves and try to upgrade Maddison. I’m not sure if Wolves will be as good defensively with Otto and Doherty (potentially) sidelined! Otto is out for 6 weeks! Confirmation from the Portuguese Football Federation. I shouldve gone for it when I posted last week. Held off and it cost me 0.2 more..
Why does everyone’s preference seem to be David Silva over Sterling. Sterling plays higher up the pitch, takes some set pieces, and is generally younger/fitter. I appreciate silva is a great footballer but at 32 and with KDB yet to return from injury – do we not expect more from Sterling than silva? Just wondering if I am missing a trick here? Silva has undoubtedly been going through a good purple patch of late, but I’m not sure whether he will sustain that over the course of the season like Sterling could. If you really want to free funds then Mane for Mahrez who is definitely finding his form and looks to have settled in the side. He got star man despite a Jesus hatrick so possibly favourable with the whoscored rating system too. Should get a good game time with kdb out. I’m leaning towards this transfer. Maddison —-> Shaqiri if Mad is still injured this weekend. Otherwise can swap Maddison for Gomez and keep Doherty. Either that or just use one sub, straight swap, Mane for D Silva. Can’t afford Sterling. Mane been poor recently. Think he needs to go. Yeah, I get the point but I decided upon a potential rotation policy for the midfield slot between Sterling, D.Silva and Mane depending on form etc. I made the move to D.Silva this time for a bit of added value (player value changes) and cashed in on Mane dropping and Silva rising in value. Also, Sterling has been known to sit out games post IB and with Mendy also being out now, that could pave the way for more game time for Sane down that left hand side. With Mahrez competing for the other side too completion for places is very high now. I will go for Sterling at some stage though no doubt. Anyone see Mane crying after he missed a chance for Senegal? Get a grip mate son! I’m almost hoping B. Silva isn’t starting so that I’ve got an excuse to move him on. Is anyone else worried about Richarlison this weekend if you don’t own him already? They are playing Cardiff. Depends on whether Sigurdsson is playing even then I don’t think I would take out a good city midfielder in B.Silva for an Everton player. I think B.Silva has been the unsung hero of dream team this year. Always delivering points. Yeah he’s been good for me but it’s a tough call. Two transfers remaining and £1.3m in the bank. Trying to assess fixtures up to end of the year. Feel personally that Man Utd and Chelsea have the “easiest” set of fixtures, followed by City and Arsenal. Spurs are tough up to end of GW15. Not sure what transfers to make until I assess injuries and line ups at the weekend. Ryan is one I’d like to ship out but Brighton’s fixtures are ok’ish up to end of GW15. Martial interests me – he’s on form and despite their poor start, Man U have decent fixtures. But would he outscore any of my front three? Tottenham have the worst immediate fixtures but Kane can always pop up with a goal. Kane to a Martial opens up the opportunity to upgrade Ryan / Maddison / B Silva significantly. Only toying with ideas at the moment! Would Maddison to Richarlison work in terms of budget? I’d be tempted to do that for this weekend and keep the other transfer. Quite a few interesting articles out there regarding Martial. It seems that he is way outperforming his stats right now (40+% conversation rate of his chances). When you consider the top top strikers usually have a conversation rate of below 20% over a season, you’d probably be right to assume a drop off at some stage. Having said that, United’s fixtures look decent and he seems nailed on right now. He’s certainly one I’ve been tempted by. Could be worth the punt Dave. Are you sticking with Maddison for now also? Who would you consider losing for Martial though Chris? When I was considering the move it was going to be for Kane. I’m personally sticking with Kane for now though as I want to see how things go for Spurs now they have the main players back in their midfield. Once you take Kane out it can be difficult to get him back in further down the line. Martial is not a move I’m going for right now but I can see the logic of the people considering it. A gamble but a gamble that could pay dividends. Guys, as we head closer to December transfers, team will be. 1.9 million itb, have to keep Mane & Kane, waiting for them to be prolific, & rivals above me don’t have them, chasing teams with Chelsea back 5, had considered taking out Hart & Gomez, who has tougher fixtures coming up, for Keppa & Doherty, Digne of Everton also looks appealing, but might not be worth considering Keppa, as I’ve said leaders have Chelsea back 5, any suggestions appreciated, cld just sit tight, Martial is a great price, but don’t really want to touch front 3. I’d favour Kepa and Doherty over Hart and Gomez as you’ve already got Robertson. How many transfers do you have left? DTT, only got one left this month, so Mendy out, Richarlison in, the Hart & Gomez out, for Keppa & Doherty in will probably be first two transfers in December, thanx for reply. A lot of the FPL community are going mad for Digne right now. Personally, I’d need to see a few more clean sheets from them before I’d consider him. Decent attacking stats though so could be worth the punt to get ahead of the curve? I had M.Keane for a while who is always good for points including the odd goal and assist, although he is a bit heavy on the price at 4m and Everton face Liverpool, City and Spurs in their next six, so maybe the prices of Everton defenders could fall a bit soon. Hadn’t looked that far ahead for Everton fixtures Lee, that’s pretty tough, still going to put Richarlison in with last transfer this month, hope it pays off. Going to monitor Digne for remainder of month Chris, have another look at him, when December transfers become available. Yeah, if Everton were able to start keeping clean sheets I’d have a look. Kinda the same principle why I haven’t gone for Trippier yet either as he’s an attacking points machine.